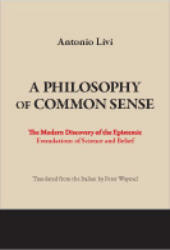 Title: A Philosophy of Common Sense: The Modern Discovery of the Epistemic Foundations of Science and Belief Author: Antonio Livi Translated from the Italian by Peter Waymel Imprint: The Davies Group, Publishers soft cover 186 pp. USD 24.00 ISBN 978-1934542361 February, 2013 The author provides, in A Philosophy of Common Sense, a logical justification for the modern philosophical choice of realism over both skepticism and rationalism. Many contemporary philosophers have deemed it necessary to use the term “common sense” during the course of their epistemological discussions; moreover, they have used the term “common sense” with a positive epistemic meaning. The epistemic value of common sense was the best critical argument in order to re-vindicate the possibility of metaphysics—a metaphysics they wanted to be radically realistic and capable of avoiding both rationalism and scepticism. Livi groups their discourses into two basic categories: a) the value of common sense as a universal body of experience-grounded truths that constitute the logical condition of possibility for both science and faith; and b) common sense as the absolute condition of possibility for inter-subjective communication. Neither category, however, has been able to clarify either the concrete contents of common sense or its proper nature and epistemic function. Livi provides a new, organic proposal for a critically sustainable definition of what “common sense” is that will give full value to the many modern efforts to rehabilitate realism. In a work of interest to both British and American scholars, he founds his original proposal on a new investigation of those modern thinkers who argue against the idealistic presupposition. CONTENTS Chapter One: A Proposal for a New Philosophy of Common Sense [1.1] Stating my proposal [1.2] The epistemological nature of common sense [1.3] The epistemic function of common sense [1.4] The content of common sense [1.5] What I intend to affirm with a philosophy of common sense Chapter Two: Demonstration of my thesis on the existence of common sense and on its epistemic function [2.1] The object of the demonstration [2.2] The presuppositions of the demonstration [2.3] The method of the demonstration [2.4] The carrying-out of the demonstration [2.5] Carrying out the demonstration [2.6] The specific arguments of the demonstration Chapter Three: Epistemological criteria that follow from the demonstration of the existence and the epistemic function of common sense [3.1] The logical foundation of knowing by means of inference [3.2] The logical foundation of knowing by means of testimony Epilogue Bibliography Author Antonio Livi is Dean of the Philosophical Faculty at the Lateran University (Rome). The main subject of his research is the truth-value of knowledge in its different levels or meanings: ordinary knowledge, scientific inquiry, and religious belief (especially Christian faith). He is the author of some twenty books and hundreds of essays and journal articles.